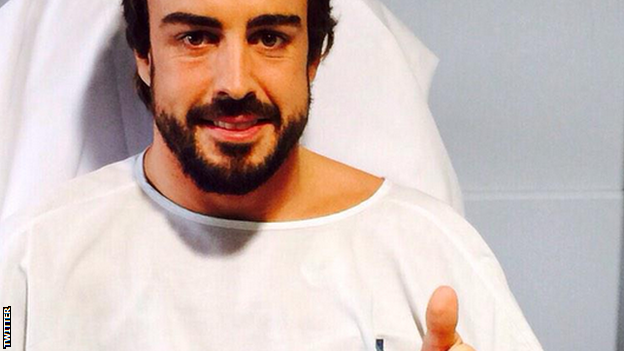 Two-time world champion Fernando Alonso is making a “solid recovery” just a day after his crash in Formula 1 testing. His McLaren team also revealed he had undergone a “thorough and complete analysis” and the results were “completely normal”. They added the accident was down to unpredictable “gusty winds” and there was “no evidence” his car suffered “mechanical failure of any kind”. The Spaniard, 33, is being kept in hospital for further observation. No decision has yet been made on his participation in the third and final round of pre-season testing, which begins later this week. Alonso suffered concussion after hitting the wall on the exit of a right-hand turn at the Circuit de Catalunya. Cars can reach speeds of 150mph at that point on the track, although Ferrari’s Sebastian Vettel, who was following Alonso at the time of the crash, said his rival’s speed was more like 90mph. McLaren also revealed more information about Alonso’s treatment in the immediate aftermath of Sunday’s crash. “From the scene of the incident, he was driven to the circuit’s medical centre, where he was given first aid and, as per normal procedures, was sedated in preparation for an air-lift to hospital,” read a statement. “In hospital, a thorough and complete analysis of his condition was performed, involving CT scans and MRI scans, all of which were completely normal. They also explained what they had learned from their “detailed analysis” of Alonso’s damaged car. “His car ran wide at the entry to Turn Three – which is a fast uphill right-hander – allowing it to run onto the Astroturf that lines the outside of the track,” added the statement. McLaren also addressed what they described as “erroneous rumours” that “Fernando was rendered unconscious by an electrical fault”. But McLaren’s preparations have been troubled, with repeated engine reliability problems restricting their mileage in testing.